Avaaz - Prime Minister Cameron: No more drownings! We, citizens from across Britain, call on you to urgently hold a full day debate in the House of Commons on the current refugee crisis and move fast to introduce a policy which drastically increases the numbers of refugees our country gives sanctuary. This is the biggest refugee crisis since World War II and we want Britain to throw these desperate families a lifeline. We call on you to respond with humanity and compassion to make our nation proud. 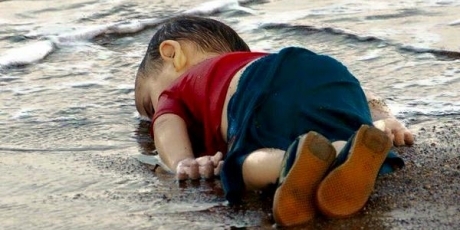 This image of a Syrian baby lying lifeless on the beach is too heartbreaking to ignore. But our Government is doing just that, refusing to give safe haven to any more desperate families in the biggest refugee crisis since World War II. David Cameron’s refugee policy is Britain’s shame. Britain has let in fewer than 300 Syrianswhile Germany expects 800,000 refugee applications this year! But Cameron is coming under intense pressure from his party, local councils and even the Daily Mail to change his position. MPs return to Parliament on Monday -- they could hold an emergency Full Day Debate and finally replace his policy of cruelty with compassion. But it won’t happen unless enough of us demand it. EU leaders are tabling an ambitious humanitarian policy right now, but the UK has totally opted out. We have no time to lose! Join the urgent call for Cameron to throw these desperate refugees a lifeline -- and we’ll deliver it straight to Parliament next week.